On March 17th 2019, the Luck of the Irish was not with me. 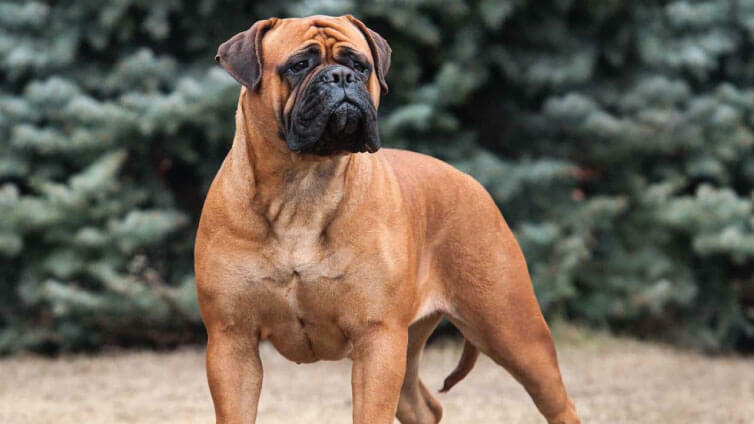 Brody, the fear aggressive Bull Mastiff that lives next door, was once again the biggest dog in our yard. Even though he isn’t supposed to be there. Our property is large. During his impromptu visits, I’m always concerned that he will run into the road and am always trying to get him to come to me instead. Or at the bare minimum to go home. I know not to make sudden moves or direct eye contact, and to make sure this big dog doesn’t feel crowded or cornered. Not sure what was different this night compared to the others. He would run towards me (like a bluff), bark, and then run away. This is his normal behavior, however tonight he decided to give me a little nip while he retreated. It hurt like a nip would. Nothing to be concerned about. My jeans weren’t ripped from the dog bite. This time, the neighbor came over to get Brody (she heard the barking and ran out). We actually stood there talking for at least thirty minutes. Brody approached me again, and after several minutes he was smelling my hand. This was a first. A few more minutes, I was able to pet him (as long as I didn’t look at him). I didn’t tell my neighbor that he nipped me because it didn’t look like there was any damage. I didn’t want her to worry and after all, it was only a nip. We finishing chatting and I head back towards my house. As I walked up the steps on my deck, I felt something wet on my leg and touched it. When I brought my hand up, it had blood. “This isn’t good”, I thought to myself and made my way up to my bathroom to check on my leg. Again, there was no damage or tear to the khaki pants I was wearing, however, when I removed my pants I was shocked at the damage I saw. I knew that a band-aid couldn’t fix it. I went out to show my husband and he immediately said that we needed to go to the hospital. On the way to the hospital, I called the police to file a report. I didn’t want to press charges but wanted the incident on file in case anything in the future occurred involving the dog. However, when we arrived at the hospital, I was required to file a report since it was a dog bite. Now the big question was, “Is the dog up-to-date on his shots”? We’ve lived in our house for almost 2 years and this was the second time I had a conversation with my neighbor. In other words, I didn’t know if this dog bite needed special treatment. My neighbor found out about her dog biting me when the police went to her door at midnight. She thinks he’s up to date on vaccines but is unsure. The hospital encourages me to have a series of rabies shots. 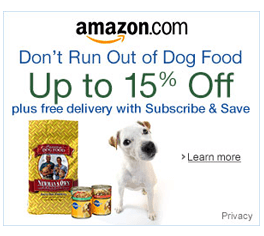 I decided against it considering it’s my neighbor’s dog and can be kept abreast if he would, in fact, have rabies. Had it been a stray dog, I would have had the series of shots. We arrived at the hospital at 10:04 PM and are there until 5:32 AM. I left with two stitches and an open wound so it could drain. 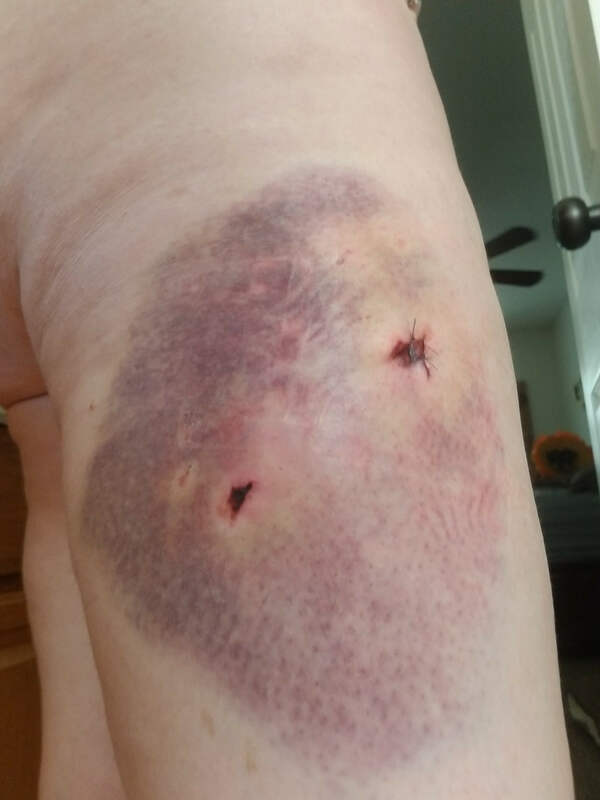 It’s incredible that this dog bite didn’t break the material of my pants, yet left such a violent wound. The neighbor came over to apologize the next day, so I showed her the dog’s handy work. She promised to have her fence fixed and to never let Brody out unsupervised again. She purchased a heavy duty chain to keep him in her yard. 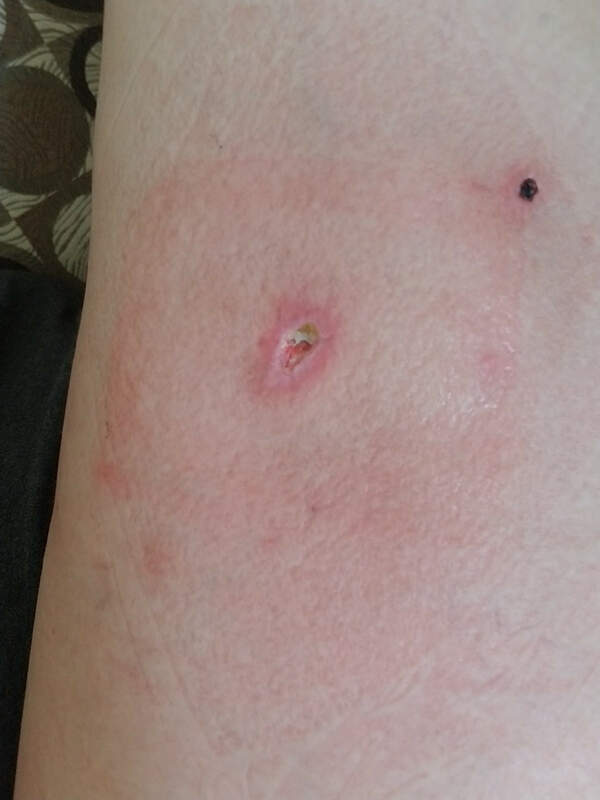 A dog bite puncture wound is usually a two-part wound. You can see in this photo below, where the largest bite is from the top of the dog’s jaw. The smaller wound is the bottom. 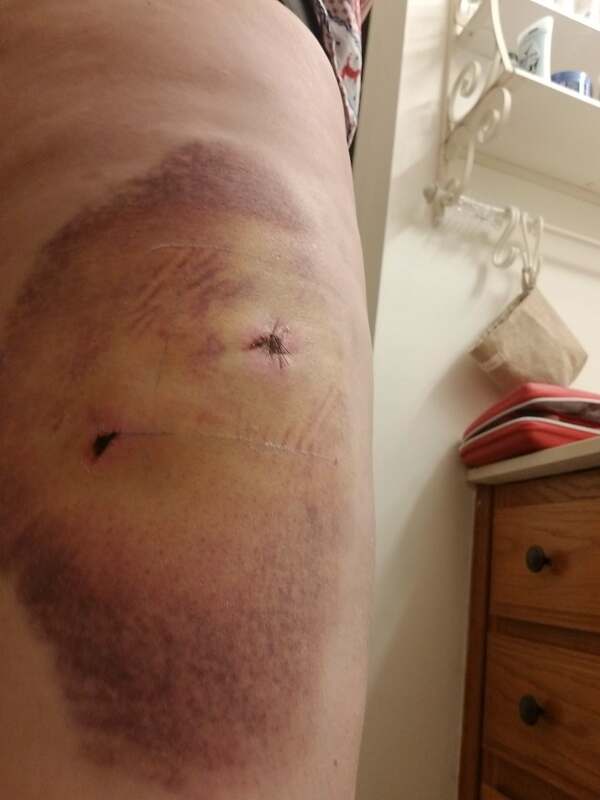 The inflammation around the bite started almost immediately, as blood began to pool from the wound. 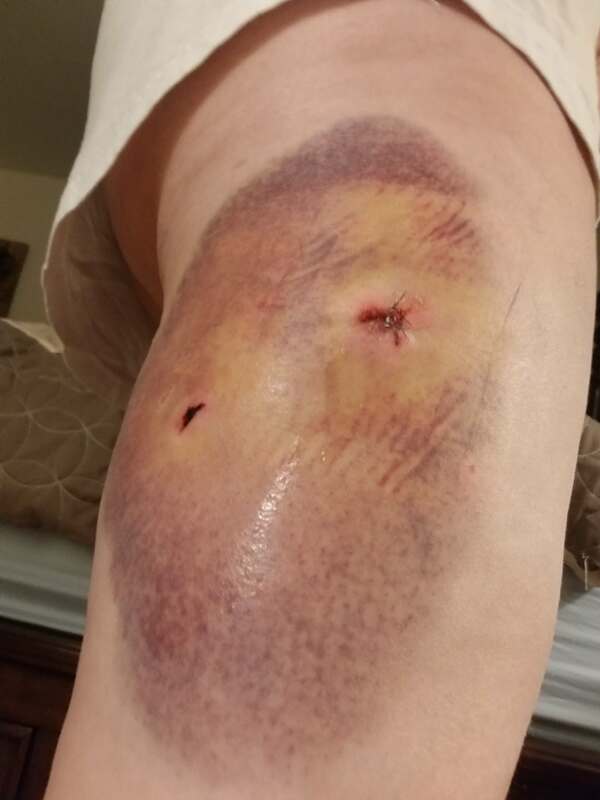 Swelling and brusing from the dog bite became even more ugly than the couple days before. At this point, I did begin to worry. 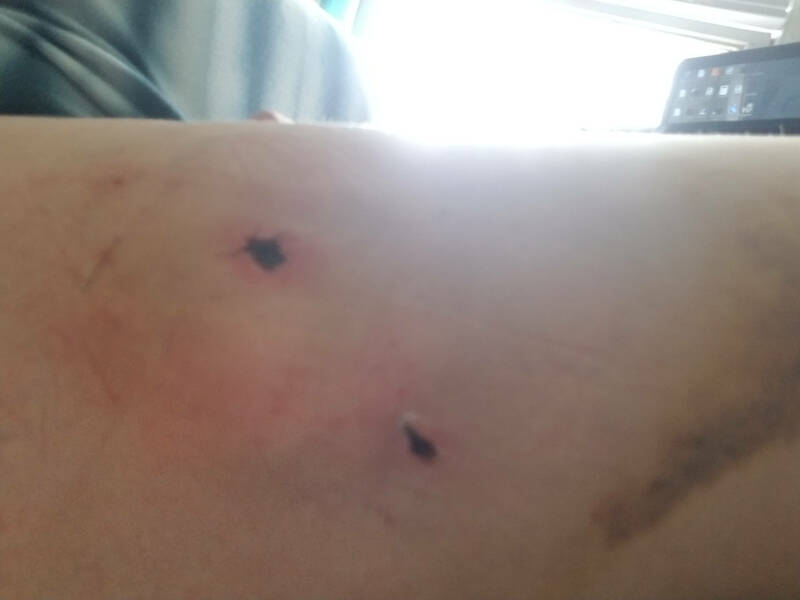 Did the hospital clean the dog bite appropriately? Was this injury treated right? 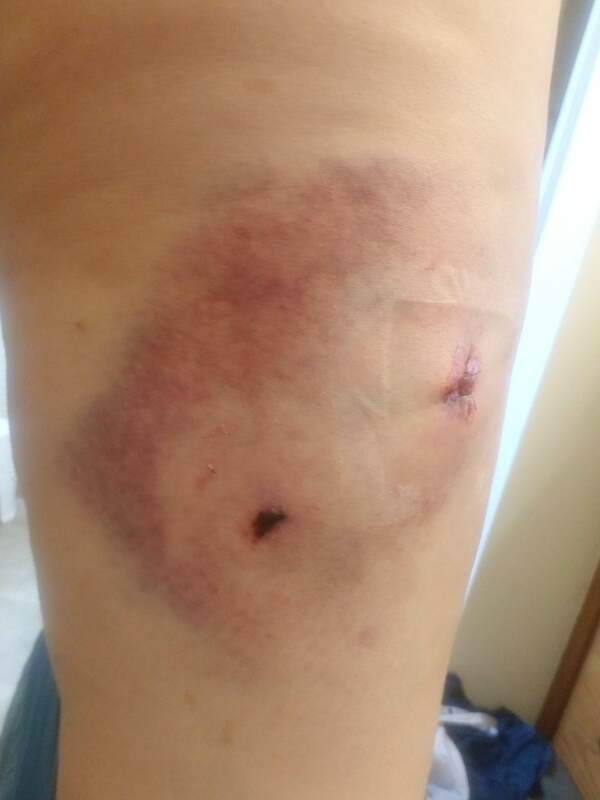 The skin around the dog bite became firm as impacted blood was still present. And, to make things worse, it began to bleed again. I was panicked. But, I spoke with my doctor and was informed that everything is progressing as expected. If the pooling didn’t dissipate, I’d need to have the brusied area drained. Not much of a change from the dog bite puncture wound. The bleeding stopped and the bruising looked pretty normal. While I was tired of having the injury at this point, at least I was no longer concerned. Bruising is almost non-existent. But my leg had become strangely itchy. I stomped my leg today (whoops!) and I now have pain in my wound area. Still itches too! Tomorrow the stitches come out!! On the 10th day, I got my stitches out! Hooray! I also took my last dose of augmentin (which is the antibiotic the doctor gave me). So, elated, I go to the doctor to have the stitches removed and he informs me that the stitch removal won’t be happening. He tells me some of the tissue on the wound is necrotic and he fears removing the stitches would lead to the wound opening up again. I left the doctor with my stitches still attached. He put me on a different antibiotic and now have to apply a warm compress three times a day. Then, I am instructed to coat it with a prescription antibiotic ointment. More treatment for a dog bite that just doesn’t want to stop haunting me! The eleventh day was a startling one. I started work at 8:30 AM, and left by 9:15 AM to go to Urgent Care. I bled through bandages – twice. It freaked me out but the doctor at Urgent Care explained it’s normal. Daily warm, wet compresses, some drainage. All gross, but feeling better. The stitches are finally removed! Now I must watch the drainage for next 7 days. Drainage has been at a bare minimum. I’m still wearing a bandage. Brody hasn’t been in our yard since the bite. We now have our neighbor’s phone number and have chatted with her several times. She’s visited us a few times as well. It’s a crazy way to make a friend, but this actually brought us closer to our neighbor. I now have a healthy respect for large breed dogs. What I thought was a nip and nothing more than a bruise turned out to be something much more serious. If he had attacked me, It’s quite possible wouldn’t be here to tell about it. 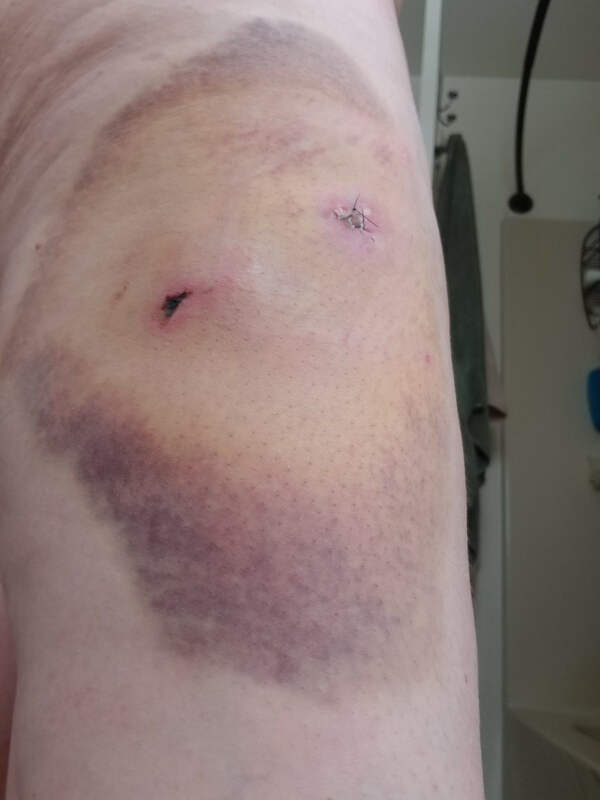 My best advice – don’t take a dog bite lightly. Get medical help right away. As you can see, there can be a bigger recovery process than you imagine. If my husband hadn’t forced me to go to the hospital, I’m not sure what state I’d be in 22 days later. I still hope to become friends with Brody.